Upon landing in Havana and departing the plane, Justin and I first noticed the stale smell of tobacco smoke. Smoking indoors is allowed in designated smoking areas, but the smell was more stale as if we walked into the twilight zone of the 1960’s with chain smoking the norm. Passing through customs was efficient with the attendant over the counter speaking some English and barely looking older than 18. The longest wait was for our bags to arrive as we glance around noticing large boxes containing electronics and televisions as part of the checked items at baggage claim. According to my research, since the travel ban has loosed, over 180,000 Cubans have left the country under a travel visa, and I expect are the ones bringing these hard to find items back home. At the curb was a taxi coordinator or cab boss as we call them. He spoke English, asked our destination and relayed it to the taxi driver in Spanish. We acknowledge that we don’t have a hotel yet, and asked for recommendations. I had a list of 4 hotels with the Hotel Nationale as the first. Prices were not available online, so I asked if it was affordable. The boss laughed and said in broken English that what is affordable for me may not be affordable for him. Roughly how much per night I ask? 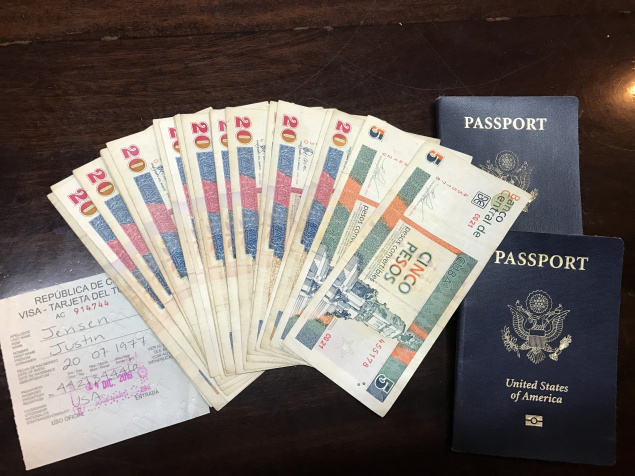 Two hundred Cuban Convertible Pesos (200 CUC or $228 USD). It’s Christmas Eve. I smile and say yes. Hotel Nationale. We go. Our driver speaks broken English. He says he is from Cuba. We start our journey with the basics using Google Translate. What a great icebreaker question, right? He says everyone is happy. “Contento” but a few are sad. “Triste” he says. We pass several monuments and signs with the late President on display. I ask if these would be removed since his passing. He emphatically says no. 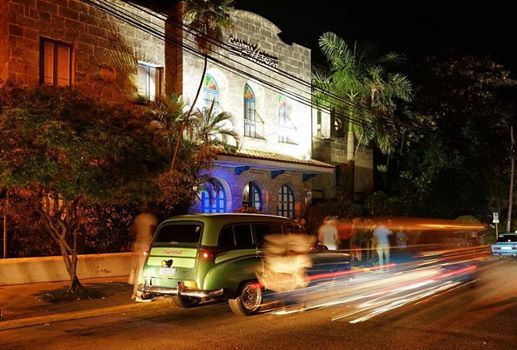 Cuban history. “Have you ever been out of Cuba before?” I inquire? “How easy is it to leave the country?” I ask. After a few mistranslations, he finally motions his arms like he is paddling a boat. “Barco? !” I exclaim, and he laughs. So the only way to leave Cuba is by boat to Miami. We laugh, and I say, “No, legally? How do you leave Cuba legally? “Ah, muy “caro” he says forcefully. “Muy, muy caro.” Very very expensive. We needed to exchange money, so the driver stopped near downtown at a money exchange office. Typically, the further away from the airport you are, the more likely you will get a better rate. We arrived in the heart of a neighborhood with a short line out the door. An older gentleman stood as security. I walked into several booths with glass partitions. The exchange rate for US dollars to CUP carries a hefty fine of 13%. 1000 USD translates to $862. The next stop would be the main hub downtown, the Hotel Nationale. This iconic hotel, upon arrival, has a doorman and a turn of the century vibe. Pauli Ingles? I ask. She smiled at my attempts at Spanish. Do you have any rooms for tonight I queried? She said they did but cautioned that since it is peak season, it would be expensive. She motioned to the printed ledger detailing peak season and non peak season. $380 CUP or roughly $440 US after the tax. Gulp. I felt like I was walking into the Ritz hotel in Manhattan on Christmas Eve asking for a room. I looked at Justin, thinking about the money in my pocket, rationalizing that it was Christmas Eve. . . And we didn’t buy any presents. “Si,” I said. One night only. She took both our passports, filled out the information card and put our two hotel keys into a small envelope. Next, she wanted payment. I pulled out an American Express. No, she frowned. Nothing American in Cuba, she explained Next, I tried my debit card with a VISA logo. “No” she said. Again, an American card. Yikes. Cash it is. $380 CUC was carefully pulled out of my wallet and counted. I handed it to her, and she said $572 CUP ($663 USD) Pardone. Yes, I know this is Italian, but it is my backup language when my mind slips into my vocabulary bank seeking to communicate without using English. $572 she repeated, pointing to the sign indicating that this was for two people. The blood rushed to my toes. If I said yes, that would be 1/4 of our budget for the entire trip. I have the uncanny ability to justify anything, however, this time, I knew that I would be feeling regret. There is a difference between paying this kind of money for a once in a lifetime experience, but as I looked at the dated decor offset by several painted box beams and crystal chandeliers, I knew the nostalgia of Christmas would wear thin. Justin smiled at her, and ducked down below the desk in a playful gesture and said, “look, I’m not here.” She wasn’t amused. Lowering my voice and my head simultaneously I said we were unable to pay that for the room. I made the decision unilaterally. Justin standing poised, ready for the next direction. I turned around and motioned to go outside. He said we should put our bags in the room first. I gave him a sheepish gaze and quickly walked out to an open table in the lobby bar. I explained we were not staying there. He was not privy to the pricing specifically because I had been handling the negotiations and currency exchange. Wifi is available at some hotels, always purchased separately and only available in the lobby area.Attempts at booking a room previously did not work from my phone in Cancun. 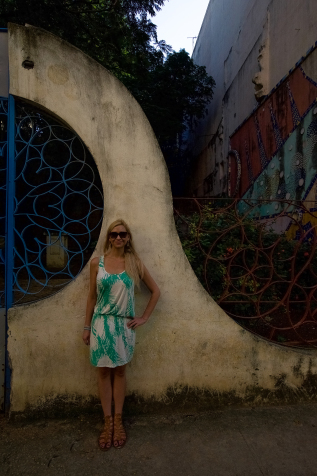 I had downloaded two apps specifically tailored to Cuba: eTips and Triposa. The trips app gives you a “book hotels and hostels” subcategory, however, when you examine each listing more closely, you will find details pulled from other sources, address information, and an occasional review. What is missing is a phone number or way to contact the hotel. The app does offer a CityWalk option, which gives the user the ability to determine the walking distance, along with other desirable stops along the way. As I later discovered, there is a bar crawl component that allows you to navigate through a saved list of preferred stops while strategically stopping at bars along the route. Who knew. The WIFI at Hotel Nationale was the most expensive of the tip. $7 CUC ($8 USD) for 1 hour, where the rate every other location we encountered was $2 CUC or roughly $2.50 USD. The wifi is consistently slow and many times was down or under repair. 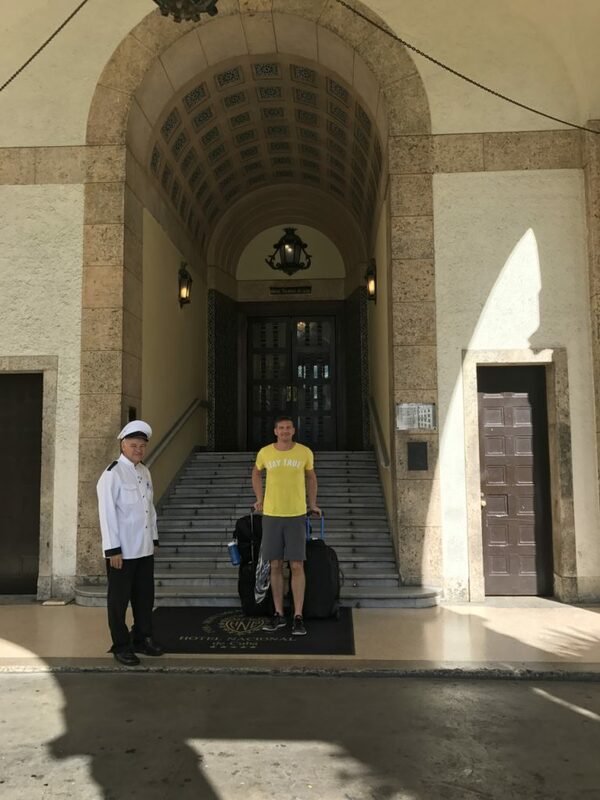 After running into many roadblocks to book a place online, Justin and I hailed a cab assuming that trying a few hotels with a local driver would be preferable to dragging our back up and down unfamiliar streets. Hopping into a new cab, the driver asks our destination. We say we don’t know. We just want something affordable, preferably under $100 a night. He said he could help and asked if we were okay renting a room. Still, under the sticker shock from Hotel Nationale, we emphatically said we would. Several blocks outside of the main downtown, the streets narrow and the density increases. We pass several blocks seeing a spattering of street vendors, citizens going about their day to day work, and pull to a stop aside under a sign saying room for rent. The taxi driver calls out to the open window, and a woman leans out. The dialogue I deduct is asking if she has a room available. All full she says, and motions directions ahead. The driver continues for a few more blocks stopping again. He motions for me to join him. We stand in from of a doorway with a security camera position above and ring the bell. He instructs me to look up at the camera so the owner can see me. The door unlocks. We climb a steep marble stairway to greet a thin attractive woman who motions us in. She welcomes me in broken English and motions me to a room. I look around. A towel display shaped in adorned swans adorns the queen bed, flanked by two twin beds. I notice air conditioning and a private bathroom. How much I ask. Quickly the driver chimes in, $100. I look at him disapprovingly. The woman remains quiet. I turn to the woman and say I want to see her advertised price. She says she doesn’t have an advertised price. The two hastily discuss in Spanish and the taxi driver hastens his speech and starts raising his voice. I interject, I will pay no more than $70. She quiets the cab driver, turns to me and says the room is $30 per night. $5 dollars per person for breakfast if we choose. The taxi driver looks defeated, exposed. We unload the bags. I inquire about the cost for his fare. $8 CUC. I give him $15 begrudgingly inside still feeling vulnerable, but with a look of genuine sincerity in my heart. I don’t fault him. I am quite confident the $60 or whatever he may have negotiated with the owner of the house, would be life changing for him.